Crew: Kim Hollamby, Piers du Pre and Howard Jones. To: Upton Marina, Upton-on-Severn, Worcestershire. Port engine start hours: 321.7. Finish hours: 324.0. Hours run: 2.3. Stbd engine start hours: 320.1. Finish hours: 324.1. Hours run: 4.0. Log start: 3457.1. Log finish: 3477.2. Distance run: 20.1. 1045: depart mooring in Gloucester Dock. 1305: arrive Yew Tree Inn. 1345: depart Yew Tree Inn. 1515: alongside berth C20 Upton Marina. A damp day this with scarcely a break in the rain to lift the spirits. Even our rugged outdoor type Piers, who is used to bracing the elements onboard his Princess V39 sportscruiser, gave up getting soggy on the lid and tried our Sealine’s inner helm for size once we had dropped back down into the Severn via Gloucester Lock. We steamed the windscreen to opacity by cooking scrambled eggs and making copious cups of coffee on the hoof. The radar was working well but we thought visual nav might be deemed safer and so resorted to the old trick of wiping washing-up liquid on the windscreen to kill the condensation. What with that and throwing olive oil down the loo to stop a particularly squeaky pump, it’s surprising what you can find in the galley to keep the ship running as well as the crew. At least our problem was stopping water from falling on our heads. The particular difficulty for Graham Hyde, owner of five boats and landlord of the Yew Tree Inn at Chaceley Stock on the river’s west bank, is keeping it away from his feet. This historic pub has become a particularly popular haunt of motor cruisers on the Severn during the summer with the pontoon often five or six boats deep. The locals stick to their bar which is kitted out in hunting regalia, while Graham’s croanies (as they are known) enjoy a room with a nautical air about it. The flags flying on the lawn are raised at dawn and lowered at dusk and, judging from comments heard from a number of owners in the past couple of days, a lot of effort is made to make the waterside visitors welcome. The Yew Tree’s problems come in the winter when the Severn floods. The rising waters once took the most direct route and knocked on the front doors. Now a defence wall stands in the way so the river proves who is master by taking to the roads instead, turning country lanes into deep waterways and the pub car park into a lagoon. This winter has been particularly bad, with five different floods refusing to obey last orders, but Graham seems to take it all in his stride. 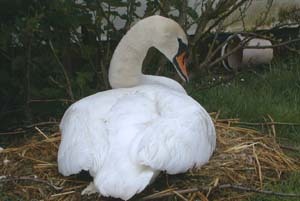 He’s even sorted out Mildred, the resident swan. She used to make her nest near the water’s edge and as a consequence often lost her eggs when the river flooded. Graham got angry with her three years ago, moved her eggs to the safety of the high ground, made her a new nest and firmly told her to stay there. She’s done so ever since. Apparently Mildred’s hiss is worse than her bite although we kept our distance, especially after being told she should be the proud mother of nine cygnets in the next few days, all things being equal. Hopefully they won’t get lost when Graham changes the name of his hostelry back to its original 17th Century title, the Ferry Inn, once his sign writer gets back from a two month trip to Russia. Underway from the Yew Tree, we were soon upon Upper Lode lock near Tewkesbury. It has a peculiar bowl shape to the first half of its chamber as you enter but the rain was falling with a determination and so we vowed to have a closer look on the way back.